At Home with Chas: Cozy up your home. I change my home around a bit according to the seasons, and sometimes the holiday. I like the freshening up feeling. It makes everything feel cozy and it's a nice change for the eyes, too. My children are now very fond of the times when we spruce things up a bit around the home. It doesn't have to cost very much at all... If anything. Pinterest has TONS of ideas if your stumped. Just use your imagination. You could gather some pretty branches from a tree outside. Pick some pumpkins from your garden. Use some scrap fabric and make your own pumpkins, like the ones I made YEARS ago that adorn our piano from year to year. 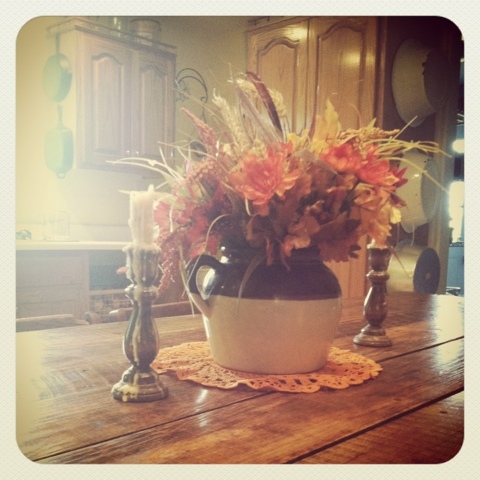 We have gathered many things over the years to use for all fall decorating. My youngest actually said, "Mom, your only using 3 boxes this year???" 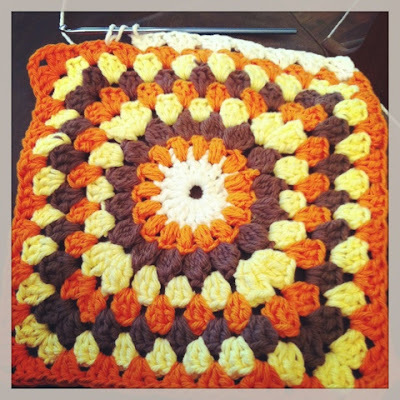 Another addition for this years fall decor is a large autumnal colored sunburst granny square pillow. This is made from scrap yarns and I'm just recovering a pillow I already have. No money involved at all. I'll make sure to post a picture when I'm finished. But I really like the color combo going on. but my best advice is to do what your family likes. I have gathered birds nests, mismatched pillows, drying flowers, maps on the wall, scriptures over the doors, baskets galore hanging from the ceiling... you get the idea. We decorate with what we use, we use what we decorate with... sometimes. Make your home accessible and friendly. I find it so sad to have a home that is stark and pristine and people are afraid to kick their shoes off and sit on the couch. Make your home a place where people want to visit. Where they would be happy to come, have a cup of coffee or tea and stay for a while. I'm joining up with the ladies at Joyous Notions today! I like the big tins on your kitchen wall, and the table looks cozy! 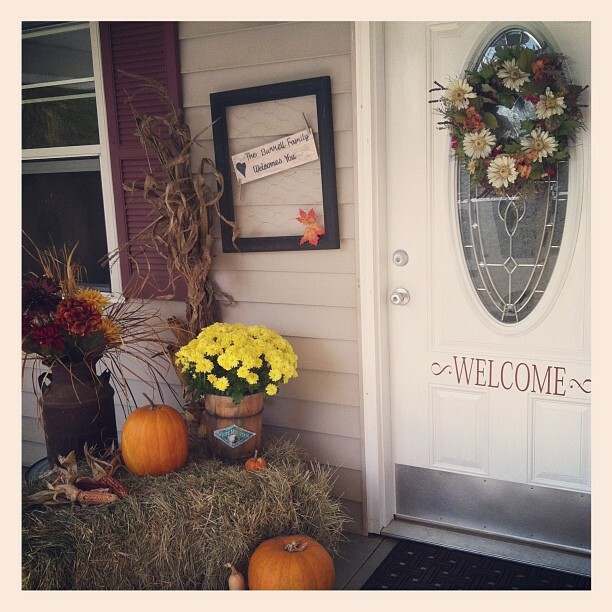 Love the warm front porch! I've followed your blog for years,and always love the thoughts, ideas, inspirations, and honesty that you share with. 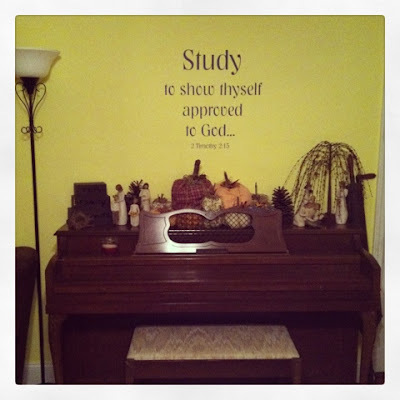 I'm in the middle of working with my Freshman in HS (homeschooling 3...) and am about to pull my hair out. Just one of those moments...decided to bop over to your blog and was just glad to read another homeschool mom's thoughts. Thanks for your time spent sharing and God bless your family and homestead! The knitting cushion cover seems awesome But I've never learned how to knit.But probably this has given me inpiratio to get started with,thanks! Your Kitchen is simply Awesome! I need to get some classes from you lol.